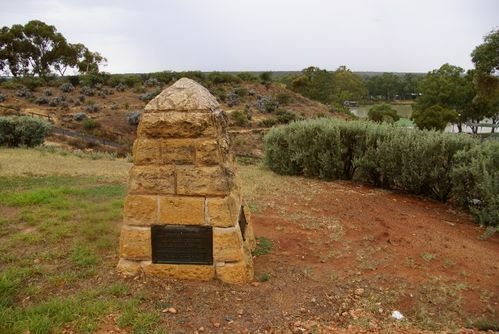 A monument commemorates the centenary of Captain Charles Sturt`s exploration of the River Murray in 1830. Additional plaques were placed on the memorial to commemorate the centenary of his expedition in 1844 and a further plaque placed on the memorial on 2004 commemorates the 165th anniversary of his 1839 expedition. Captain Charles Sturt became the first white explorer to pass through the area when he rowed his whale boat down the Murray River and past the current-day site of Morgan in early 1830. The Commissioner of Public Works ( Hon. M. McIntosh) will leave today for Renmark to take part in the celebrations arranged by the Royal Geographical Society of Australasia of the centenary of Captain Charles Sturt's Murray River exploration trip in 1829. He will be accompanied by the Engineer-in-Chief (Mr. J. H. O. Eaton) and Mr. F. M. McMillan, MP. After the opening of the Simpson Newland Lock, Sturt memorials will be unveiled at Renmark on Wednesday, Loxton, Cobdogla (Loveday memorial) and Kingston Punt on Thursday; Morgan and Mannum on Friday; Milang and Pt. McLeay on Saturday: Mr.McIntosh will unveil all these memorials with the exception of Mannum, where the ceremony will be performed by the Minister of Agriculture . (Hon. J. Cowan), and at Milang and Point McLeay, where Sir Lancelot Stirling will officiate. The Advertiser (Adelaide), 11 January 1930.
Who, as Second-in-Command, camped near here from Tuesday 10th to Saturday 21st December 1839 during the River Murray - Mt Bryan Expedition, which paved the way for the development along the River Murray and for the River to be a viable trade and transport corridor. Councillor John Lindner, Mid Murray Council to commemorate the 165th anniversary of the original expedition. Central Australian Exploring Expedition passed her 23-25 August, 1844. The principal discoveries were Barrier and Grey Ranges, Cooper and Eyre Creeks. This tablet was unveiled 1944.